Prior to beginning any new dermatitis treatment, one needs to prepare the skin, and allow the skin to heal from the effects of previous treatments which may have left the skin damaged or overly sensitive. We often hear people tell us that the treatments they had been using left their skin so sensitive that "even water hurts their skin". Prepare for Dermatitis-Ltd III by allowing the skin to heal as much as possible in preparation while your order is being processed and mailed for the two to three days. Please use only a gentle cleansing soap such any one of the three soaps below. After washing the affected skin, apply the Jojoba Oil to your hands, then rub them together. Once you have equal amounts, apply the Jojoba oil to the location where the dermatitis is. You can search one of the three recommended soaps at your nearest pharmacy or grocery store in almost any country in the world. So use them for the good quality, convenient availability, and low cost. Or you may purchase them on line. Also Neutrogena (the transparent facial bar) "dry skin formula - fragrance free" provides most excellent results at a low cost and is found in most stores or on line at Drugstore.com. Use the moisturizer Jojoba Oil to assist in healing your skin from the harsh products of the past. It is very much like natural skin oil. Jojoba oil can be found at many health food stores. To learn more about the many therapeutic uses of jojoba oil or purchase jojoba oil online at JojobaCare. Change your diet of foods and drinks. Can you imagine your favorite house plant after you pour a left over soda drink on it. Soon it will begin to wilt. To learn more about the delicate balance between acidic and alkaline foods and discover ways you can control and manage your body's function and reaction we invite you to review the latest in rosacea treatment and research as the factors of the skin whether it's the face or the hand are regulated by the same principles. General over view on how to apply Dermatitis-Ltd III: It is best to start at night after reading and implementing the Letter of Instructions which is a brief of what this site is about. Specifically after bathing or washing the affected dermatitis area, glided the Dermatitis-Ltd III disk over the affected area while it is still 100% wet. This will allow the ingredients to dissolve off of the disk onto the affected dermatitis areas. Just go over the affected area only 'once' as "Less is more". The ingredients will be invisible on the skin so do not go over it again. Normally two applications are made each day at a time that is convenient for you such as before going to work and after work or at bedtime. You can use it any time that the skin is wet. 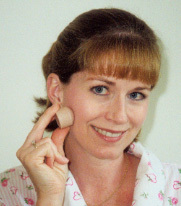 It is ideal for a make-up foundation as it is totally invisible. If you see it, then you are using too much. Your order of Dermatitis-Ltd III will come with a personalized letter of instructions based on the information you provide on the order form.